Tough couple of days for the Rockies‘ star-studded lineup. 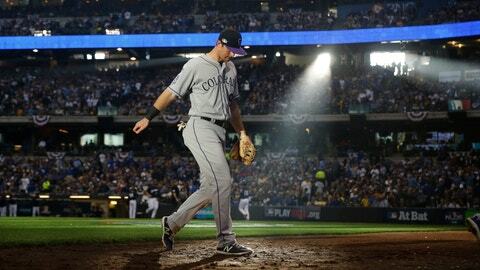 Arenado helped Colorado rally against Milwaukee’s vaunted bullpen in Game 1 of the NL Division Series, but the Rockies were unable to finish off Jeremy Jeffress. Mike Moustakas then hit an RBI single in the 10th inning to lift the Brewers to a 3-2 win Thursday. Led by Arenado and Trevor Story, Colorado finished among the major league leaders in several offensive categories this year. But the Rockies have been held in check since they bashed five homers in a 12-0 victory over Washington last Sunday, leaving them in a tie for the NL West lead. Colorado had just one hit Thursday before Gerardo Parra and Matt Holliday opened the ninth with consecutive singles off Jeffress, who had made 11 consecutive scoreless appearances since Aug. 31. Charlie Blackmon singled in Parra and DJ LeMahieu reached on an error before Arenado tied it at 2 with a sacrifice fly to center. The Rockies had a chance for more, but Blackmon was tagged out in a rundown on David Dahl’s grounder to first and Jeffress struck out Story to end the inning. That missed opportunity proved costly when Moustakas came up with the game-ending hit against Adam Ottavino. Game 2 of the best-of-five series is back at Miller Park on Friday. Colorado had a chance to win the NL West before it lost 5-2 in the tiebreaker at Los Angeles on Monday. It had just two hits before Arenado and Story hit back-to-back homers in the ninth inning. Arenado hit a sacrifice fly in the first in the wild-card game Tuesday night in Chicago, and Colorado didn’t score again until Tony Wolters‘ 13th-inning RBI single in a 2-1 victory over the Cubs. The Rockies finished with 11 hits, but went 1 for 10 with runners in scoring position and left 11 runners on base. Playing in their fourth city in five days — covering approximately 2,700 miles — it was more of the same in the NLDS. Perhaps that shouldn’t be such a surprise. Playing away from hitter-friendly Coors Field, the Rockies ranked 20th in runs (335) and 29th in batting average (.225) on the road. Carlos Gonzalez tripled with two out in the fifth for Colorado’s first hit. But Ian Desmond tapped back to the mound on Corbin Burnes’ next pitch, ending the inning. LeMahieu and Ryan McMahon each walked, and then were thrown out trying to steal second. Arenado hit .297 with an NL-best 38 homers this year, helping stop the Triple Crown bid by Brewers star Christian Yelich. But the 27-year-old Arenado went 0 for 3 with two strikeouts in just the third playoff game of his stellar career. Story, who set career highs with 37 homers and 108 RBIs this season, also struck out three times, and Dahl went 0 for 4 with two Ks. None of the Rockies’ hitters saw a pitcher more than once.